This year’s show will celebrate the cultural diversity of our schools and community! 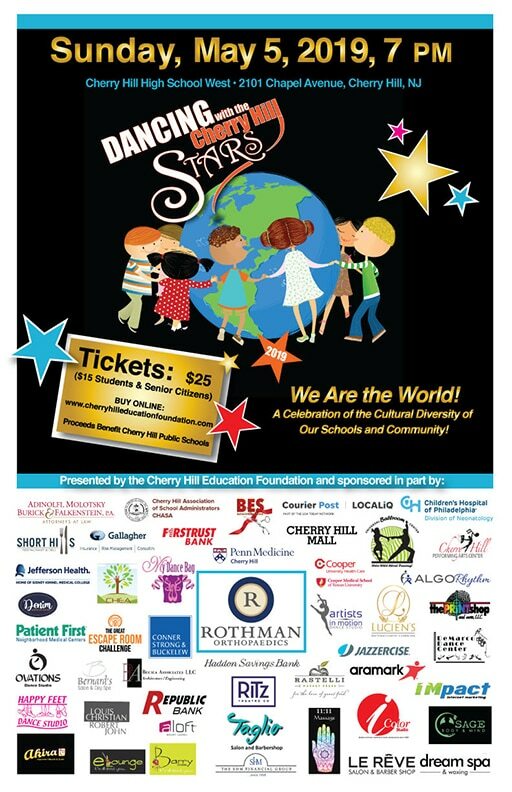 Tickets go on sale in February for the 2019 edition of Dancing with the Cherry Hill Stars, which will be held on Sunday, May 5, at 7 pm, in the auditorium at Cherry Hill High School West. The event is presented by the Cherry Hill Education Foundation, an all-volunteer, non-profit organization dedicated to raising funds to support innovative educational initiatives for students in the Cherry Hill Public Schools. Now in its 12th year, the show is the Foundation’s signature fundraising event. The couple with the highest fundraising total will win the coveted first place trophy. Supporters can vote online prior to the show (online voting will begin soon) or in person at the event. One dollar equals one vote. In addition, a panel of judges will present awards for Best Overall Performance, Best Technical Performance, and Most Creative Performance. Ticket sales will begin in February. Tickets are $25 each ($15 for students and senior citizens 55 and over). All seats are reserved. Since late 2007, the Foundation has raised more than $1,200,000 in grant funding and donations to support educational programming throughout the Cherry Hill School District. Grant requests are submitted each year by teachers and administrators. Funded grants have ranged from Smart boards, iPads, Chromebooks, and other technology requests to books for classroom and school libraries to climbing walls and outdoor playground equipment. The Foundation has supported more than 360 grant requests and also provides annual support for the district’s Academic Recognition Banquet, Project Graduation, and Freshmen Orientation events. In addition, CHEF solicits funding support from area businesses and foundations for programs such as the Mt. Misery environmental education program for the district’s 6th graders, the 3rd grade dictionary project (conducted in partnership with the Cherry Hill Rotary Foundation), and more. For a list of grants funded by the Foundation, please visit our grants page HERE. « Thanks to Our 2018 Golf Tournament Sponsors!